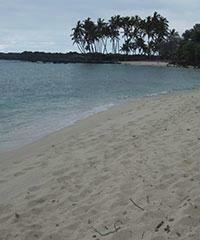 Many beaches are great for swimming but that is not true of this beach. Pololu Beach is located at the entrance of the Pololu Valley which is the last in the series of valleys beginning with Waipio Valley that guard the northern flank of the Big Island of Hawaii. All these valleys are giant with huge escarpments descending to the valley floors and to the ocean below. These valleys are so large in fact that they are impassable and no system of roadways connects any of these valleys. 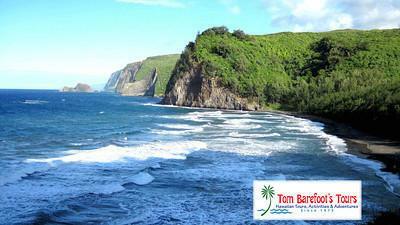 The main road on the north shore of the Big Island is #270 and it abruptly dead-ends at the cliffs of the Pololu Valley. 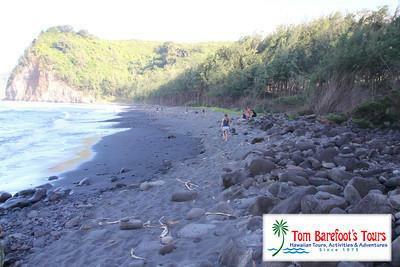 From this vantage point you can easily view the half-mile long black sand beach that lies below. The Pololu Valley is impressive enough from the lookout above by the road but if you really want to get a sense of the beach below the best thing to do is to hike the trail which winds its way down the path which is chiseled into the hillside. This on its own is no meager feat as the steps are large, steep, irregular and often quite slippery if there has been recent rain and no-one should attempt to make this journey unless they are in exceptionally good health. The flip-side obviously of going down is going back up the 400' ascent on the way back and you're likely to get quite a workout. 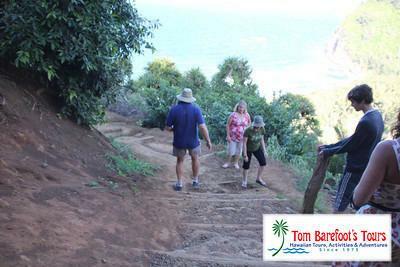 Should you choose to make the twenty-minute trek however you will be rewarded by being able to stand on a black sand beach with waves loudly pounding the shoreline and be able to marvel at the river valley and astounding cliffs and possibly waterfalls that will fall in thin streams from the top of the Kohala Mountains behind you. The sand here is very black and very course and is highlighted by the beautiful verdant greens found in the foliage on the valley floor and the deep blue hues of the Pacific. All in all you will feel that you have transcended time to find a place of antiquity and in some measure you have. This valley, as with the others found in the Kohala Range were once the home to hundreds of Hawaiians who lived in these valleys and grew the Hawaiian crop of taro which was a staple food in the Hawaiian diet. The ocean here however is no place to visit. The waves can be powerful and the rip-currents are viscous not to mention the rock coastline which provides the perfect foundation upon which to pulverize and batter a human body senseless. 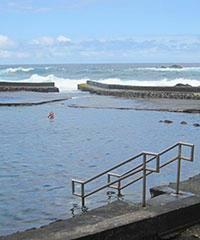 Take pictures along the entire rocky beach and enjoy the scenery but don't go in the water. 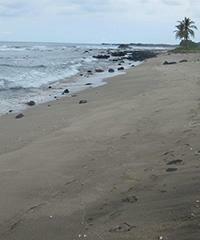 Be advised that all beaches and ocean locations in Hawaii can be dangerous including this one. Be completely aware of the ocean conditions prior to entering any Hawaiian waters however it is not advised that you enter the water at this location. Also, all shorelines and beaches in Hawaii, including this one, can be frequented by sharks, jellyfish and other sea creatures which can provide potential harm to people entering the water. There are no lifeguard towers at this location. This may be a first experience for you, but if it is it certainly won't be your last. Ahalanui Park pool is actually a thermal heated spring fed swimming area that is partially natural and partially man made. When you speak of Anaehoomalu Bay on the Big Island's Waikoloa shoreline you are talking about history of the first magnitude in Old Hawaii. This bay was a spot of large population primarily because of its ocean resources and its spectacular fishponds. As viewed from the air, the next beautiful beach to be found north of the Mauna Lani in Waikoloa is the gorgeous beach found in front of the Fairmont Orchid Hotel. 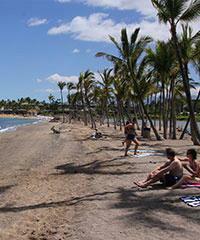 Hapuna Beach is practically a legend on the Big Island. In fact many people believe that Hapuna Beach is the most beautiful beach to be found here, and a good case could certainly be made for that. Isaac Hale Beach Park is really quite a different type of beach park. Essentially it is divided into two sides. 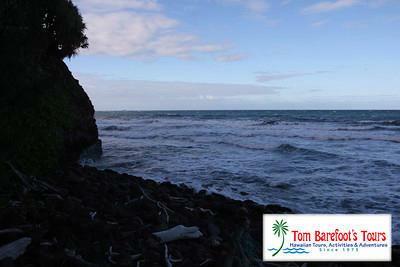 On one side is the only loading boat ramp on the entire Puna coastline. 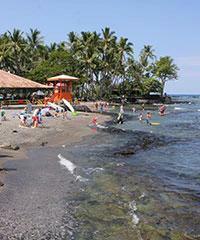 Perhaps the very best and the most famous beach for snorkeling on the Big Island is Kahalu'u Beach Park. The variety and volume of fish found at Kahalu'u will rival any spot in Hawaii. One of the most famous black sand beaches in the world was found in the area called Kalapana in the district of Puna on the Big Island. 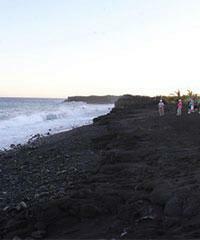 "Was" is the operative word here as this beach was completely covered by lava in 1990. Kehena Beach in the Pahoa district of the Big Island is amazing for a couple of reasons: First because of the spectacular nature of the beach itself, and secondly because of the people who tend to go there. If you're the type who enjoys a bit of 4X driving ( 2X drive if you're careful ) and hiking with your beach enjoyment Kekaha Kai Beach Park may just be the spot for you. 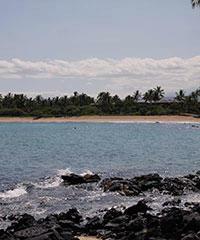 Kikaua Point Beach is a tiny but very beautiful beach that is located about ten miles north of Kailua-Kona. Kikaua Beach is perhaps the calmest beach on the Big Island being protected from the open ocean by a series of huge boulders and rocks that provide a rim for the pond-like beach within. If you're searching for a beach with excellent swimming, great snorkeling and crystalline brilliant clarity, Kukio Beach is probably not the beach for you. 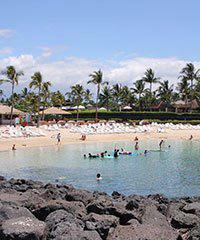 La'aloa Beach Park in the town of Kailua-Kona is also referred to as Magic Sands Beach, White Sands Beach and Disappearing Sands Beach. Though its Hawaiian name has implications suggesting it is a beach of sacred nature the other three more popular names refer to the propensity of the beach to lose its sand each winter and early spring to the currents, waves and storms that extract the white sands from the shoreline portion of the beach and temporarily deposit them further out to sea exposing dangerous exposed rocks in the process. 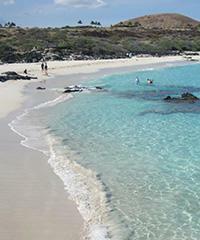 The single most beautiful beach closest to Kailua-Kona that you can get to without having to travel on an unpaved road over lava is Maniniowali Beach which is also known as Kua Bay. 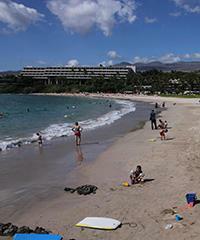 Mauna Kea Beach ranks right up at the top of great beaches on the Big Island of Hawaii. 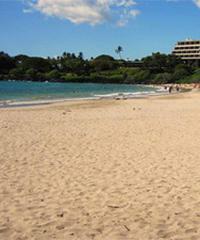 It is very close to its sister beach of Hapuna and shares many of the same attributes. 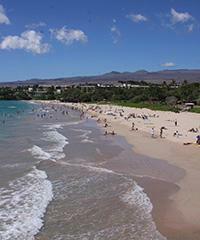 Both Mauna Lani Beach and Makaiwa Bay are located in this same description because they are entered from the same public parking access parking lot. Both are quite beautiful and snorkeling is excellent at both but they require a fairly long walk to get to each. The Old Kona Airport landing field became obsolete in the early 1970's but the one-mile landing strip still exists. This huge stretch of asphalt lies right next to the ocean just north of the city of Kailua-Kona and today serves as the gigantic parking area for the Old Kona Airport Beach. 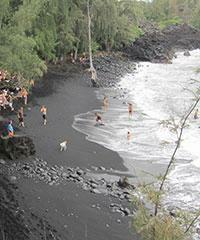 Punalu'u Black Sand Beach is the largest black sand beach in the state. 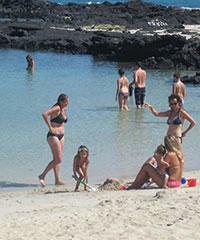 Located south of the Volcanoes National Park on the coastal Highway 11 it is a beach that is basically fairly far from populated areas and most people will decide to enjoy a quick visit when they take the southern route to visit the volcanoes if they are staying in the Kona region. If it wasn't for the fact that Spencer Beach was located so close to Hapuna and Mauna Kea Beach, it would receive more notoriety than it does. Although it is a beautiful white sand beach with a sand bottom allowing for an easy water entry, it just lacks some of the luster and beauty associated with its nearest beach neighbor. 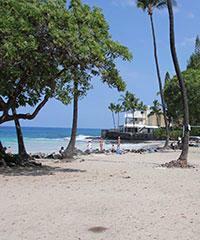 Waialea Beach is one of the most perfect all-around beaches on the Big Island's western coastline. One of the best things about the beach is that it is not located on or near a hotel so there is no problem with access directly from the road. One of the first signs you will see when you arrive at the Wawaloli Beach Park just north of the town of Kailua-Kona is a sign that says "Low Flying Aircraft, No Kite Flying". 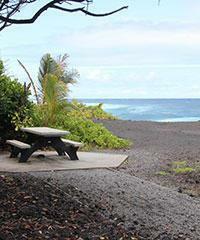 One of the oddest County parks on the Big Island is a small park called Whitington Beach Park. It is located at the 60 mile marker on the circle island Highway #11 and is a good spot to visit if you are traveling from Kona to visit the Volcanoes National Park.